Just a few days ago, my brother Cody officially ended his career with the United States Marines. He's been off of "reserve" status for a long time now, but he was still elligible to be called to duty if the need arose. December 20 marked his last day to be called and although we fully support his service in the Iraq war, it is a wonderful feeling to know he will not be going back. Two years ago, Cody celebrated Christmas in an abandoned Iraqi train station, sleeping on the concrete, if memory serves me right. 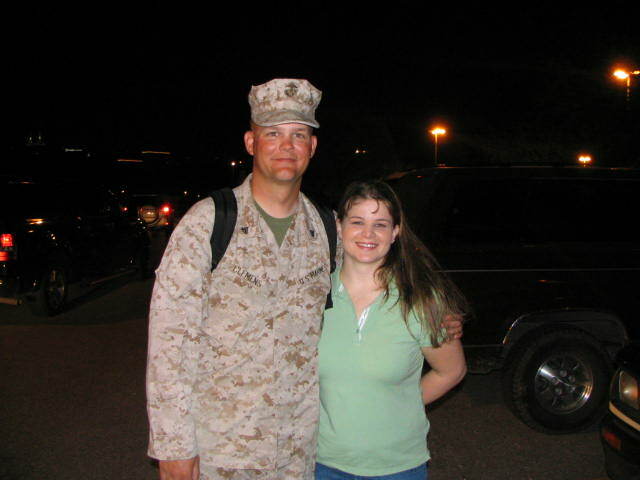 He spent several months overseas throughout Iraq defending our country. I'm very proud of his service and know that he did well. Here is a picture of Cody and his wife, Jody, just after welcoming him home from Iraq.